Microsoft launched Internet Explorer 9 Beta on Wednesday, and the software giant has packed a lot of functionality into its new Web browser including site-specific jump lists, task bar shortcuts, a new layout and a unified search and address bar. With IE9 Microsoft has focused on extending the browser's compatibility with modern Web technologies such as HTML 5 and CSS3. Microsoft says IE9 is faster than previous versions of Explorer because it maximizes your computer's hardware components, specifically your graphics processing unit (GPU), instead of improving browser speed solely through software tweaks. Beyond Microsoft's claims, the new browser is starting to win over critics for being a fast, attractive, and easy-to-use browser. However, some are criticizing Microsoft for not extending IE9 to Windows XP users, but if you're a Windows 7 or Vista user, IE9 is well worth checking out. Here's a quick look at some of IE9's top features, and a few tips and tricks to help you get the most out of Microsoft's next-generation Web browser. 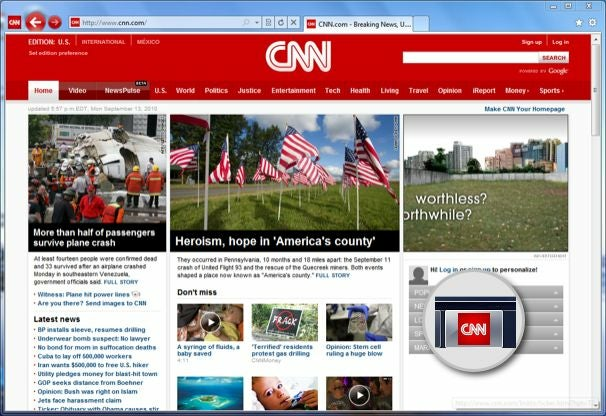 Internet Explorer 9 lets you turn your favorite websites into launch icons on your taskbar, essentially creating Web apps. All you have to do is grab the tab of the site you're visiting, and drag it down to the taskbar. This creates an icon in your taskbar based on the site's favicon (the little picture that sits next to the address bar). If a favicon is not available, then Windows uses the standard IE logo. The new functionality is a great addition, and is similar to Prism, the Mozilla Labs experiment for Firefox. But IE9's pinned sites have a few drawbacks, because the windows for your new pinned sites are slightly different than a standard IE9 window. First off, each Web app functions as a separate window, and despite the fact that IE9 added tearoff tabs (more about that later), you cannot grab a tab from one pinned site and join it with another. Say, for example, you pinned Facebook and Twitter to your taskbar. Once you open each site from the taskbar, you cannot join the two together as two tabs in one window. Once you open a site from the taskbar it is locked in its own separate window. If you happen to use a password manager that functions as an add-on toolbar, such as Lastpass, you may also lose access to your passwords within the Web app window. I turned Twitter, Facebook and Gmail into Web apps, and was unable to get the Lastpass toolbar to show up in the separate windows for each site. I rely on Lastpass to save long and complicated passwords for almost all of my Web-based accounts, so not having easy access to my password manager was a real problem. I'm not sure if the problem is on Lastpass' end or if this is something Microsoft will have to address. Either way, it's something to be aware of if you use a browser-based third-party password manager. Pinned sites also lose IE9's homepage icon found on the right side of the browser window. Granted, that's a minor complaint, but it's worth being aware of. Pinned sites may have a few minor problems at the moment, but the new jumplist feature is a great addition to IE9. Once you've pinned a site such as Twitter, Facebook or even PC World to your taskbar, just right-click on the icon to see a selection of shortcuts for that site. Right-click on Facebook, for example, and you have quick access to your Newsfeed, Messages, Events and Friends list. Twitter's jumplist options include the ability to write a new tweet, see your direct messages, mentions, favorites and search. Configuring jumplists is up to the site owner, so it's hit or miss right now on whether your favorite sites will include this functionality. At the time of this writing, for example, many sites lacked jumplists including The New York Times, Gmail, and oddly enough even Microsoft sites such as Live.com and Hotmail. Hopefully more sites will add jumplists for IE9 in the coming months. IE9 has simplified its controls and shifted the home, settings and bookmarks icons over to the top right of your browser window. The bookmarks icon (the star) has tabs for your bookmarked sites, browsing history and RSS feeds. Settings (the cog) contains functions such as Internet Options, print functions, the add-ons manager and a new downloads manager. Microsoft is taking a page from Google Chrome and giving you a unified search and address bar in IE9 called the OneBox. Since this is Microsoft's browser, the default search engine is of course Bing. But if you prefer Google or Yahoo, it's easy enough to switch. Click on Settings (the cog icon to the right), Manage add-ons, and in the new window that pops up click on "Search Providers" in the left pane. Then, down on the bottom left side of the window click on "Find more search providers." This will open the Internet Explorer add-ons gallery where you can add search providers such as Facebook, Google, Yahoo, Wikipedia and many others. If you don't find the search provider you want, you can make your own by clicking on "Create your own Search Provider" at the bottom of the Add-ons gallery page, and following the instructions. In my brief tests, IE9's OneBox search function worked pretty well, but it often wouldn't work with advanced search operators such as "site:" for site-specific searches or "filetype:". Some of the features Microsoft has added are basically playing catch-up with other browsers. Tear-off tabs, where you create a new browser window by dragging a tab out of its current window, is a great addition and standard in most other browsers. You can also consolidate regular browser tabs by dragging them back into one window. 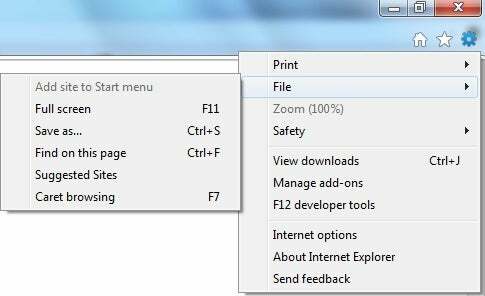 Just remember this feature does not work with sites pinned to your taskbar. IE9 also has a new downloads manager as mentioned earlier that lets you pause, restart and cancel downloads. Overall, IE9 Beta is a great start for Microsoft's next-generation browser, and is well worth trying out if you're a Windows 7 or Vista user.